SHELLY-ANN Fraser can thank her mother's uneasy relationship with the Jamaican police for helping her become an Olympic Games sprint champion. Maxine Fraser, who brought up her daughter in one of the Caribbean's meanest ghettos, believes her quickfire genes have been passed on to the 21-year-old who led a Jamaican cleansweep in the 100m final in Beijing on Sunday. Maxine has had to live on her wits all of her life and working as a street vendor she regularly has to put in a blinding turn of pace if police are chasing her for illegal trading. "This is to show that something good can come out of the ghetto. 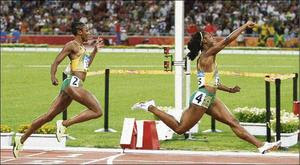 Ghetto can't hold you back as long as you have ambition," said Maxine after watching her daughter take gold. For Fraser, Olympic success will guarantee an escape from the island's grinding poverty. Her family still lives in a tenement yard in one of Jamaica's toughest inner-city communities known as Waterhouse. It is a place where zinc fences, bad roads and high levels of crime are a feature. Jamaica's track program starts as early as the kindergarten level with children as young as four running in championships at the country's national stadium. However, locals have scoffed at suggestions that drugs may be the reason for the country's recent success. In fact, many argue that the heavy consumption of yam, banana and breadfruit have helped power the sprinters.